Note: I'm not a Japanese expert. I have been using Duolingo to learn and a Japanese Dictionary (which I'm certain that some of things are wrong in it) so I'm bound to get some things wrong. If I do, correct me and I'll repair the mistake. Also, sorry for the audio quality. 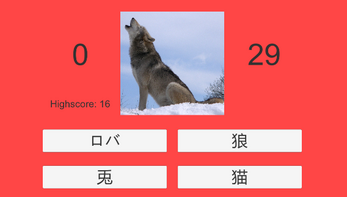 You have 30 seconds to correctly guess how many animals you can successfully translate to Japanese. What will your high score be? Just an experiment I made to make a multiple choice game.